← The F Word – What’s in a Name? “I felt like God told me I would play this part,” David Oyelowo told a crowd of Torontonians at TIFF Bell Lightbox earlier this month. When he was 7 years old, he wrote an entry in his prayer diary that one day he would portray Martin Luther King Jr.
That dream became a reality with the production of Selma, Ava DuVernay’s latest film venture. The young director – tipped to be the first Black female director ever nominated for an Oscar – has only been making films for the past 5 years. “I’m just getting started,” she says. 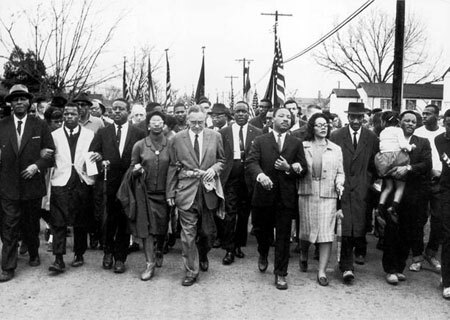 And what a start – Selma is an ambitiously successful depiction of King’s vision of a civil rights march from Selma to Montgomery, Alabama in 1965. “This film couldn’t be more relevant right now,” TIFF Artistic Director Cameron Bailey said as he hosted a post-viewing Q&A. A month after the 32-day shoot wrapped on Selma, Michael Brown was shot dead. It was a “cultural moment that echoed through the world,” DuVernay told the crowd. DuVernay sees similarities between the cultural moment of Selma and that of Ferguson. We say “Ferguson,” she explained, and not the name of the person killed (like we did with Rodney King or Trayvon Martin). Just like with Selma. Oyelowo further made the parallels between 1965 and today. As the film portrays, Black people were unfairly judged by a jury of their “peers,” who were, in many places, all White because you had to be registered to vote to be on a jury and only White people could register to vote. Even after the law began to change, it was extremely difficult for Black people to register. In some jurisdictions, an already-registered voter (and all of them being White) had to vouch for you before you could vote. Today, Oyelowo explained, we have a situation in which local prosecutors are supposed to be the people who indict the police officers accused of unlawfully shooting or restraining the Black men in these cases, and they’re not going to do that because that would discredit their past cases. “We need to press the issue that there needs to be change,” he said. DuVernay said that she feels like there’s a reason there hasn’t been a film centred on Martin Luther King Jr in the fifty years since the march from Selma to Montgomery occurred. “The time is now. It feels like the right time,” she explained. But this film is not about White people, nor should it be – we have enough of those. It’s about Black people, told by Black people. “Watching the film, there were moments when I couldn’t breathe,” a member of the audience told Oyelowo and DuVernay, referring to both the filmmaking and the story. For the film doesn’t shy away from the more brutal aspects of the civil rights movement – one of the first scenes depicts the infamous moment that four little girls were killed by a bomb in a Birmingham Church. It’s horrifically beautiful – the cinematography by Bradford Young, mesmerising. This style was very purposeful. A Phantom Camera – high speed, super slow motion – was used in four scenes throughout the film, at a point of high emotional impact. DuVernay chose this style to make the audience really watch what was happening. “It was very intentional, to force you to look at this,” she explained. Rather than when, in real life, the horrors of the world can get so overwhelming that we tune them out. This isn’t the first time Oyelowo and DuVernay have worked together. Nor, does it seem, will it be their last. Bailey brought up the idea of a muse, with DuVernay agreeing that that is exactly what Oyelowo is to her. “A muse doesn’t just have to be an older gentleman and a hot young blonde,” she quipped. Selma opens in limited release on Christmas Day before opening wider on January 9. Go see it. Posted on December 22, 2014, in Film. Bookmark the permalink. Leave a comment.